The Underground City of Montreal is both below and above ground. Located in downtown Montreal, Quebec this complex, sometimes referred to as “RESO,” or La Villa Souterraine in French, is a world in and of itself. Above ground there are approximately 120 entrances from various structures that then allow entry to the underground venue. It is one of the world’s largest underground projects. Once inside you will be afforded the opportunity to tour a combination of 60 primarily commercial sites along with some residential properties as well. The entire community is 1.4 square miles. There are condominiums, apartments and hotel rooms available, plus office space, banks and even universities and museums within its confines. You may want to check on any sports or entertainment programs at the Bell Centre that may be scheduled during your visit which is also accessible via the underground city. This facility is home to the beloved Montreal Canadiens, the city’s National Hockey League representative. Music concerts and other events are held here too. 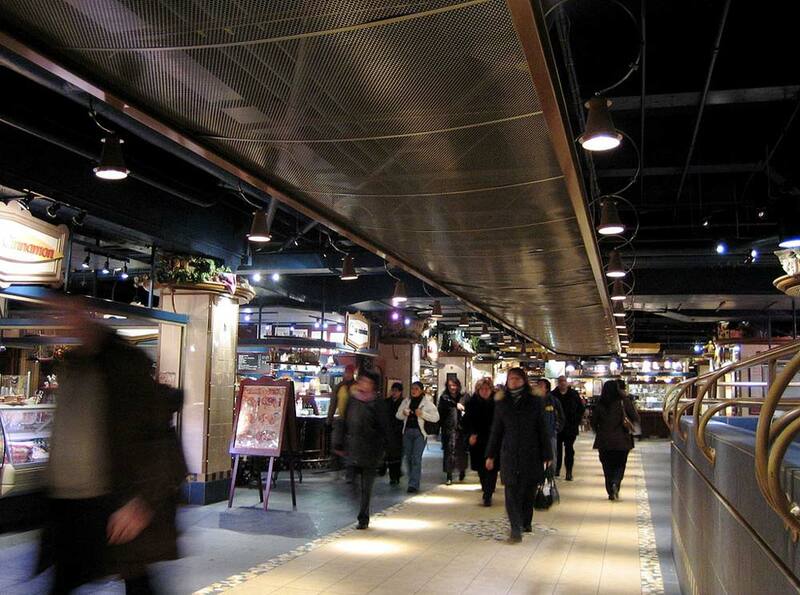 During winter, it is estimated that up to 500,000 people visit the underground city each day. In total, this underground region accounts for 35% of the commercial space and 80% of all business offices that reside in all of downtown Montreal. In essence, the area is a web of interconnecting tunnels. These passageways are air conditioned and well lit. The total tunnel space involved is 4.6 square miles. The tunnels themselves account for over 20 linear miles. Transportation to the Underground City of Montreal is perhaps the easiest part of the days navigation. No fewer than 7 metro stations, along with 2 train stations and a regional bus terminal provide access to and through this subterranean metropolis. Vincent Ponte, a Montreal Modernist city planner who passed away in 2006, is credited with the idea of the Underground City of Montreal. The original construction commenced in 1962. The plan was hatched to build the Place Villa Marie office tower coinciding with an underground shopping center below it. Renowned architect, I.M. Pei created the design. It is believed he was inspired by New York’s Rockefeller Center. At the time, the main purpose of the shopping mall was to replace a deteriorating railway system. Initially, a tunnel was constructed joining the shops with the Central Railroad Station and also the Queen Elizabeth Hotel. From that point forward, additional tunnels were built linking the metro lines to the development. Over the years as new structures appeared in above ground downtown Montreal it became a common theme to interconnect with the thriving below level marketplace. It was in 2003 that the underground city as we know it today was for the most part completed. In all, the Underground City of Montreal consists of 2,000 retail outlets, 1,600 apartments and condos, 1,200 business offices and 40 financial institutions. For the tourist, besides the 2,000 stores, shops and boutiques mentioned above, there are 200 restaurants, 40 cinemas and a variety of other entertainment venues including the aforementioned Bell Centre. There are also 7 major hotels present offering convenient accommodations.